This page introduces various encryption modes. Choose one that best suits your needs. Both Communication and Live Broadcast support encryption. For live broadcasts, if you need to use CDN for streaming, recording, and storage, do not use encryption. If you do not use encryption, you can delete the unnecessary libagora-crypto.so file in the Agora SDK to reduce the SDK package size. The Agora SDK for Android includes an independent dynamic library, libagora-crypto.so, in both the arm64-v8a and armeabi-v7a folders under libs for the app to load dynamically. Put libagora-crypto.so in the specified path of your project where libagora-rtc-sdk-jni.so is located. Call the setEncryptionSecret method to enable built-in encryption and set the encryption password. Step 3. Set the encryption mode to be used. Call thesetEncryptionMode method to set the built-in encryption mode. To reduce the SDK size, if your app uses libcrypto.so, you can use it instead of libagora-crypto.so included in the Agora SDK since both files are the same. The Agora SDK libagora-crypto.so version is 1.0.2g. 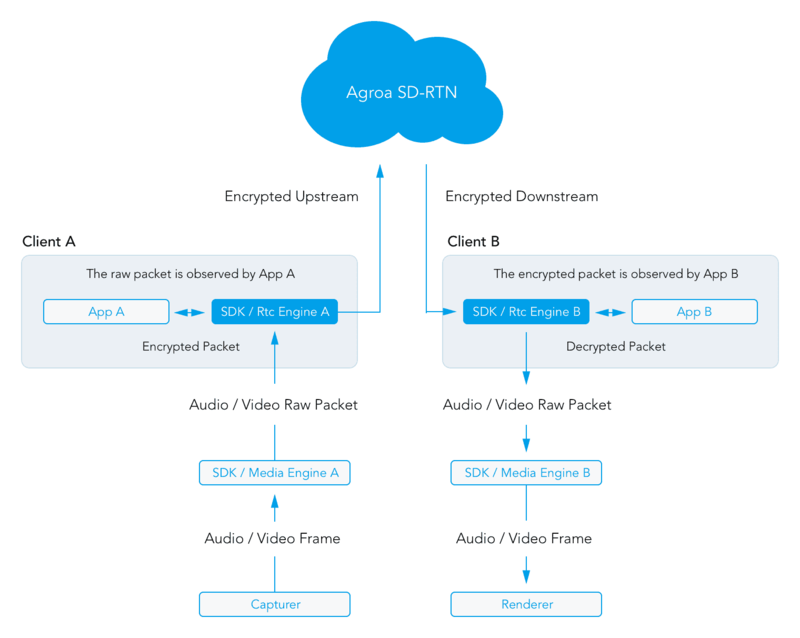 The Agora Native SDK allows your app to register a packet observer to receive events whenever a voice or video packet is transmitting. /** Buffer address of the sent or received data. /** Buffer size of the sent or received data. /** An audio packet is sent to other users. - true: The packet is sent successfully. - false: The packet is discarded. /** A video packet is sent to other users. /** An audio packet is sent by other users. - true: The packet is received successfully. /** A video packet is sent by other users. Call the registerAgoraPacketObserver method to register the instance of the agora::IPacketObserver class implemented by your application.